Harnesses are not only different from 750 to 850, they are different year to year and even model to model. And not just lengths. 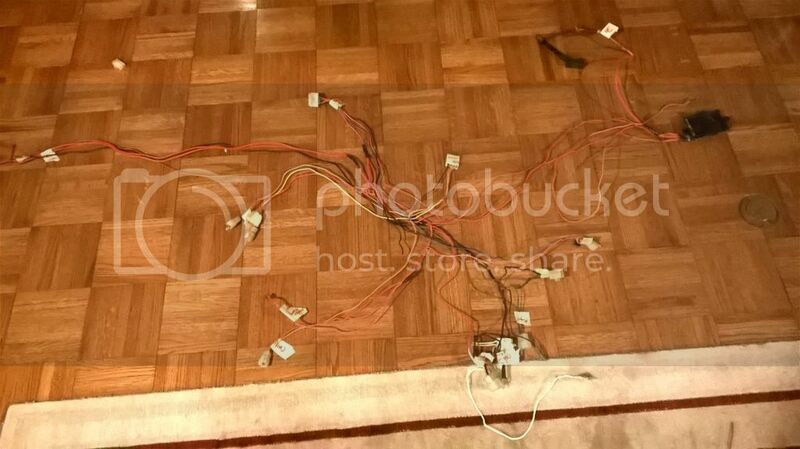 Best thing is to get the loom for that particular engine but you might be needing to buy certain relays or such. Usually they were for safety features and interlocks. For instance, the 81 850 H engine added a starting circuit cut off relay preventing the engine from starting unless the neutral switch was grounded. I did the switch with an 850 engine into a braced 750 frame, but I also completely deconstructed the harness to build a racing harness without the safeties and lights. Not worth the effort, though. 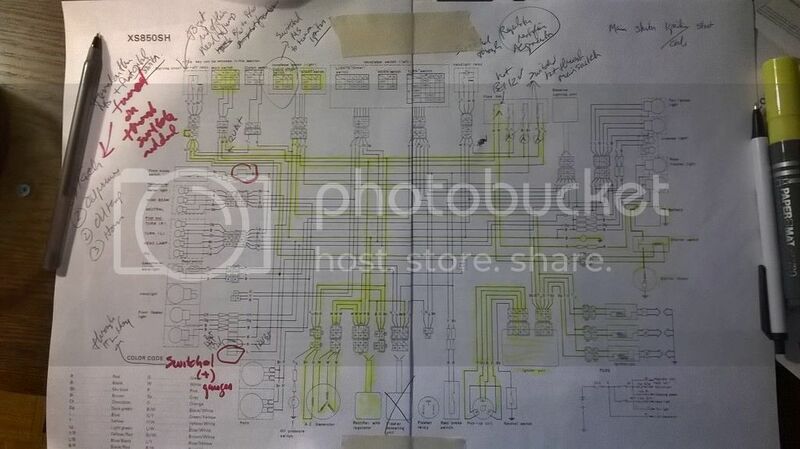 Best thing to do is get the wiring diagrams for both and see what you will need. I don't think it's a whore shot until you start posting pics of it on other people's build threads. Harnesses are not only different from 750 to 850, they are different year to year and even model to model. And mot just lengths. I did the switch from 850 engine in a 750 frame, but I also completely deconstructed the harness to build a lightweight racing harness without the safeties and lights. thanks jcw for the insight! May I ask If you had to modify the 750 frame (motor mount wise) to fot the 850 motor? Nope. But I think I did have to buy shorter front mounting bolts. Or maybe I just lost the old ones. thanks man!stunning bike! !any videos of how its running, and especially sounding ? Runs perfect. Keihin carbs from a Triumph that have been rejetting (mains and pilots), shimmed (needle) and synced. Starting is almost there. I just have to fiddle with the idle at start. Engine fires with a 2 second crank. I have to keep the idle up for about 5 minutes, then the idle shoots up and I turn the idle speed back down. After that, it's stable. Torque is really good for an old bike. I have a kz1000 and low end grunt is pretty similar. Power hangs on till probably 8500, redlines 9000. Of course top end power isn't gonna compare to a modern bike. I used to ride a zx-11d, zx-10r and k1200r. I can post a vid of it running. It's a little loud with the short, straight through, cheap supertrapps muffler I scavenged from one of my old bikes, but the sound is unique for sure. They are the Mikuni carbs. Some Triumph owners go from Keihin to mikunis supposedly for a little more power. I have a set of both and find the Keihin better built. Parts, jets seems readily available for both. The problem with the Mikuni cabrs is a tendency to wear the needle jet. So a used set of carbs may or may not have this problem. 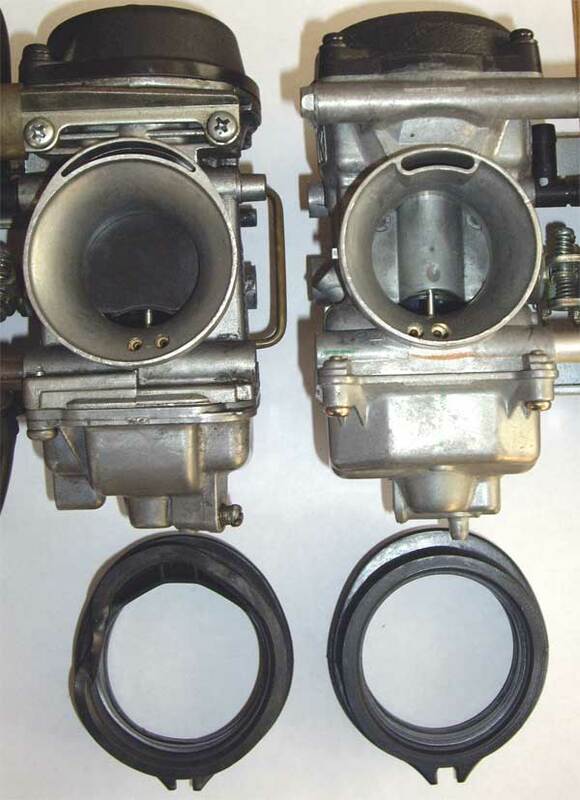 The Keihin carbs have metal slides instead of the plastic slides. And the Keihin carbs I KNOW fit direct of the stock XS boots. I read that the mikunis retaining groove is different, but when I fit my set, it didn't seem bad. Even though tuning my MKII's with pods was super easy, I'm thinking of trying a set of 38mm flatsides that I have on my Edge XCR 800 for fun. Go straight to the Triumph-Mikunis. There's a set for sale for 149 in Vienna (willhaben). Best mod I ever did to mine. I'll go for some VM36 on my XS750, but that's a thing of personal preference. I guess I will try next weekend with a car battery and jumper cables. 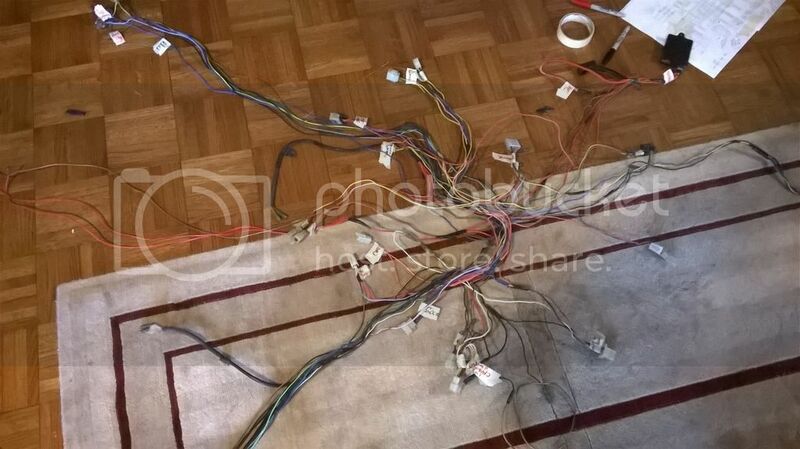 There are 5 cables going from the stock loom to the reg/rectifier.3 white cables,is it important how these cables are plugged into the reg/rec? Also no light and blinkers are working,no idiot lights (fuses are ok).any idea what could cause this complete failure of the lighting system? The cables coming from the coil going to the ignition box are ok.
No spark on cyl1.cyl2 and cyl3 have a nice bright spark.